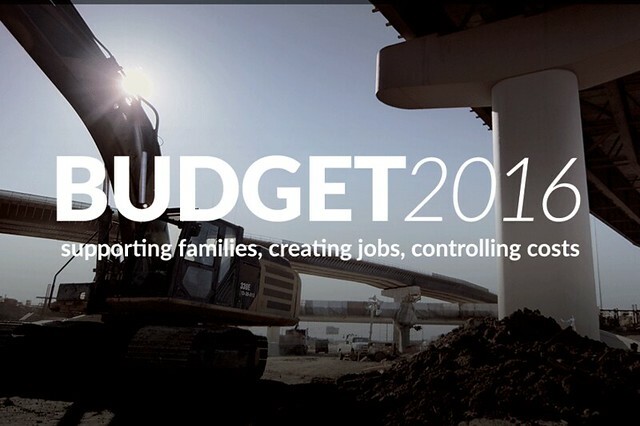 Budget 2016 - The Alberta Jobs Plan moves Alberta forward by supporting families and businesses through a tough economy, promoting job creation and economic diversification, and carefully controlling government spending. Budget 2016 includes a plan to carefully control government spending to achieve more than $600 million in savings over the next two years. Cost saving measures include reducing the number of agencies, boards and commissions, freezing management salaries, limiting department spending, slowing implementation of some platform commitments, streamlining programs, and thoughtfully addressing rising health-care costs by reducing the average annual growth to 2.5 per cent from six per cent. Alberta Child Benefit: $147 million in 2016-17 and $196 million per year beginning in 2017-18 to provide up to $2,750 each year for Alberta’s most vulnerable children and families. Enhanced Alberta Family Employment Tax Credit: a $25 million boost will allow more families to receive the credit, and many families will receive a larger credit. Together with the Alberta Child Benefit, these programs will support 380,000 children in 199,000 families across the province. $206 million for related adult and child health benefit programs. Employment and Training Programs: provincial employment and training programs will undergo a major realignment to improve access and support for Albertans who need them most. Stable funding for health care, including mental health. Stable funding for education, including fully funding enrolment growth. Stable funding for post-secondary education, including the post-secondary tuition freeze. Stable funding for social services, including Family and Community Support Services and women’s shelters. Budget 2016 cuts the small business income tax rate from three to two per cent. $165 million for two new tax credits that encourage investors to support small and medium-sized companies and encourage business capital investment. $25 million in new funding to be invested through the Alberta Enterprise Corporation to spur innovation, growth and employment in areas such as clean technology. $35 million to attract and support new businesses and pursue regional economic development initiatives. $25 million for new apprenticeship and training opportunities. With interest rates at historic lows and an economy in need of support, there is no better time to invest for the future. Budget 2016 continues the ambitious $34 billion plan introduced last year to build and upgrade new roads, schools and hospitals and create thousands of jobs. Significant investments over the next five years will also build transit and green infrastructure, affordable housing, long-term care beds, flood protection and critical municipal infrastructure, including clean water systems. $9 billion in municipal infrastructure support over five years, including $6.1 billion under the Municipal Sustainability Initiative. $6.2 billion for capital maintenance and renewal. $4.6 billion for roads and bridges. $3.5 billion for health facilities and equipment, including $1.2 billion for the new Calgary Cancer Centre and $500 million for future priority investments in health projects across the province. $3.5 billion for schools, with $2.9 billion to complete the 200 new and modernization projects previously announced and $500 million for future projects. $2.2 billion for green infrastructure, including transit, under the Climate Leadership Plan. Alberta’s carbon levy and the Climate Leadership Adjustment Rebate will encourage households and businesses to reduce their carbon emissions, while generating revenue that will be rebated back to Albertans and reinvested in the economy. This will mean a more diversified energy industry, and the opportunity to expand into new markets. Implement rebates of up to $200 for single adults, $300 for couples and $30 per child under 18 years of age (to a maximum of four children) for lower- and middle-income Albertans in 2017. Along with the price of carbon, rebates will increase to $300 for single adults, $450 for couples and $45 per child in 2018. Reduce the small business income tax rate from three per cent to two per cent on January 1, 2017. All revenue generated by the levy will be fully reinvested in Alberta’s economy. Over five years, $9.6 billion in gross revenue is forecast to be raised from compliance payments from large industrial emitters and the economy-wide carbon levy. $645 million through a new agency, Energy Efficiency Alberta, to support energy efficiency and micro-generation initiatives. $2.3 billion for consumer rebates. $865 million for small businesses through the small business tax rate reduction. $195 million for other adjustments, such as assisting Indigenous communities, and communities relying on coal power to make the transition to new energy sources. Government is committed to managing the province’s fiscal position while avoiding reckless and short-sighted cuts that would further exacerbate job losses. Health: $20.4 billion budget, includes a three per cent operating budget increase, down from an average of six per cent per year over the last six years. Education: $7.9 billion budget, fully funds projected enrolment growth of 1.3 per cent. Advanced Education: $5.9 billion budget, provides two per cent base operating grant increases to institutions and continues the two-year tuition freeze. Human Services: $4.4 billion budget, includes new Alberta Child Benefit. Freezing salaries for political staff and managers in government departments and agencies, and reducing the budgets for salaries and supplies, saving $121 million compared to 2015-16. Amalgamating or dissolving 26 agencies, boards or commissions, saving $33 million over three years. Deferring some planned spending included in Budget 2015, saving $118 million in 2016-17 and $208 million in 2017-18. Reducing health spending growth to an average of 2.5 per cent over the next three years, down from an average of six per cent each year for the past six years. $20 million from Alberta Community Partnership grants. Limiting growth in operating spending to an average of two per cent per year, well below projected population growth plus inflation. Non-renewable resource revenue is budgeted at $1.4 billion in 2016-17, its lowest in 40 years. As a result, Alberta’s fiscal recovery is now expected to take longer than anticipated in Budget 2015. Including the Climate Leadership Plan, total revenue will be $41.4 billion in 2016-17. Revenue is expected to grow to $45 billion in 2017-18 and $49.6 billion in 2018-19. Despite the economic challenges the province faces, Albertans continue to enjoy the lowest overall tax regime in Canada.